Potential British Record Shore Caught Bass. The British record for Bass from shore may have been broken by Steve Caves. 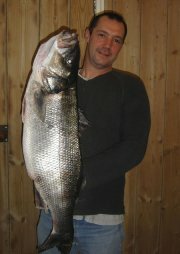 The Bass weighed in at 19-11-12 from Sandown Pier,Isle of Wight - beating the old record of 19-0-0. The fish now has to be identified by the British Rod Caught Fishing Committee before it becomes the British Record. Steve Caves had his bass on a whole squid bait fishing late evening. An excellent fish from shore. There were 36 Flounders weighed in over the 2 days (last year 33 Flounders) 6 being over the 3lb mark. Best Flounder Junior - 3 prizes taken. All 10 prizes were taken on Saturday & Sunday.